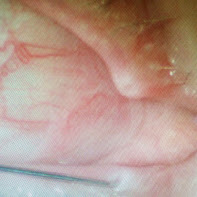 58 year old female presents with recurrent episodes of medial redness, crusting and medial lid tenderness. What is the diagnosis and how do you conform? Localized medial redness with discharge and tenderness loacized to the medial lid area (first photo) shoud indicate acute canaliculitis. 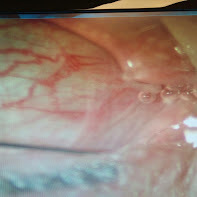 The second photo demonstrates lacrimal irrigation via the lower punctum with regurgitaion via the upper puctum with purulent discharge confirming acute canaliculitis. The most common cause of acute canaliculitis is Actinomyces israelii , a gram-positive bacillus with fine branching filaments, but other bacteria, fungi (eg, Candida albicans), and viruses (eg, herpes simplex) may be causative. Symptoms and signs are tearing, discharge, red eye (especially nasally), and mild tenderness over the involved side. An increasingly common cause of canaliculitis is a retained punctal plug (inserted as treatment for dry eyes) that has migrated into the canaliculus from the punctum.Canaliculitis can be differentiated from dacryocystitis. In canaliculitis, the punctum and canaliculus are red and swollen; in dacryocystitis, the punctum and canaliculus are normal, but a red, swollen, tender mass is located in or near the lacrimal sac.Treatment is warm compresses, irrigation of the canaliculus with antibiotic solution and removal of any concretions or foreign bodies, which usually requires surgery. Antibiotic selection is usually empiric with a 1st-generation cephalosporin or penicillinase-resistant synthetic penicillin but may be guided by irrigation samples.